The IPOB leader said that there will be no election in Anambra State if the Federal Government refuses to hold a referendum. 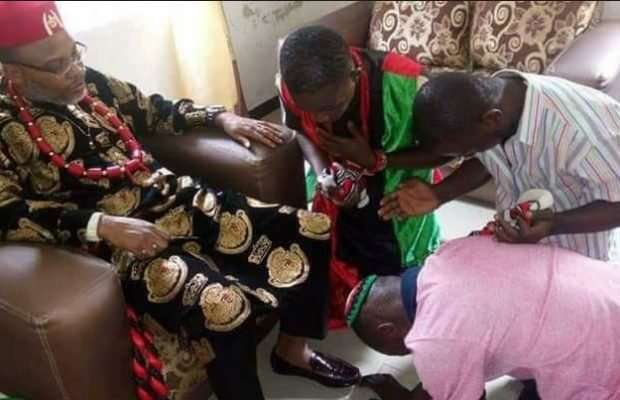 The leader of the Indigenous People of Biafra (IPOB) has said that he is totally in control of the people of Anambra state. Kanu said this while speaking to Punch in an interview, on his call for a boycott of the the November 18, 2017 governorship election in the state. What is your position on the November 18 governorship election in Anambra State? There will not be any election in Anambra on the 18th of November, 2017, and there won’t be any going forward until they give me a date for a referendum. They know what to do, it is very simple. They should convene a meeting, I attend or I send my representative and they give us a date. That is very simple. That is the only way we can have elections. Have you considered that your position could lead to bloodshed? Where on this earth have you ever found self determination resulting in any form of conflict? Only in Nigeria, because those in the political class are not educated enough to understand or distinguish between self determination and war. They don’t mean the same thing. Referendum does not mean the same thing as war. If there is war, we still have to sit round the table to discuss, ultimately. If there isn’t any war, we still need to discuss. Things cannot go on this way. The status quo can no longer hold. Like Evangelist Eliot Ukoh said, if on or before October 1st nothing happens in terms of substantive restructuring, they will support us. Are you not bothered that Ohanaeze Ndigbo and other Igbo leaders have distanced themselves from your call for election boycott? No, I’m not because the people are with us. We control the people 100 per cent. And come to Anambra on the 18th of November, 2017, the whole world will be amazed. What will IPOB do to people who decide to come out to vote in Anambra on November 18? What will happen if party members decide to come out to vote for their candidates? Those party members are IPOB members as well and I can assure you that they will listen to us and they will not vote. But if people come out to vote, what will IPOB do? Nothing, we are entirely peaceful. We are not stopping anyone from voting. If you want to vote, you can go and vote. We are democrats. According to reports, Nnamdi Kanu was chased from the palace of Obidiegwu Onyesoh, traditional ruler of Nri, a community in Aniocha local government area of Anambra state on Thursday, July 27, 2017.